Wal-Mart will reportedly become the second major retail chain -- after Best Buy -- to sell Apple's iPhone. The iPhone 3G will be sold for $197 for the 8GB version, a whopping $2 cheaper than in AT&T and Apple stores. 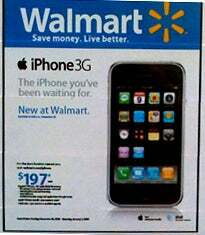 Reports about iPhone 3G being sold in Wal-Mart originated as early as November, and now, according to Bloomberg, employees in the cell-phone department at five Wal-Mart stores in California are being trained to sell the device. The iPhone was sold initially only in Apple and AT&T stores. Many were expecting a much cheaper, stripped-down 4GB version of the iPhone 3G, sold for $99 with a two year contract. However, the latest reports say that this seems unlikely. In contrast, Reuters is reporting that the $99 entry-level iPhone is still on track. It is not yet known when the iPhone 3G will come to Wal-Mart though, as various sources quote either December 15 or December 28. Apple's iPhone has now 30 percent of the U.S. smartphone market and almost 17 percent of the worldwide market, second only to Nokia. If Apple will really launch a $99 iPhone, the Cupertino company might end up dominating the smartphone market -- as it does with the iPod -- while other major players, such as RIM's Blackberry, could become just niche players.